Positive developments in relations between the United States and China gave regional investors reason to cheer yesterday. One boost came when Canada granted bail to Huawei chief financial officer Meng Wanzhou, relieving worries that her arrest would heighten trade hostility. Then, US President Donald Trump said he might intervene in the Huawei case if it would help achieve a trade pact with China, despite US Trade Representative Robert Lighthizer insisting that Ms Meng's arrest is a criminal matter entirely separate from tariff talks. "Whatever's good for this country, I would do," said Mr Trump. China then said it had agreed to cut tariffs on US-made cars from 40 per cent to 15 per cent, essentially removing the tariff hike it implemented in July. This will also put tariffs on US cars in line with auto imports from other countries. "Though this will not close the trade gap between the two economies by a sizeable amount, this will be the first positive outcome from the Dec 1 dinner meeting between President Xi (Jinping) and President Trump," noted ING economist Iris Pang. Key indexes in several markets rose 1 to 2 per cent on the news, with Tokyo's Nikkei 225 up 2.15 per cent. South Korea and Australia both ended about 1.4 per cent ahead, while Hong Kong's Hang Seng Index added 1.61 per cent. However, shares in Shanghai put on just 0.31 per cent. Local investors took heart from the progress in trade talks - and rightly so, after private economists revised their forecasts for Singapore's 2019 gross domestic product (GDP) growth downwards yesterday while warning that US-China trade tensions are a key risk. 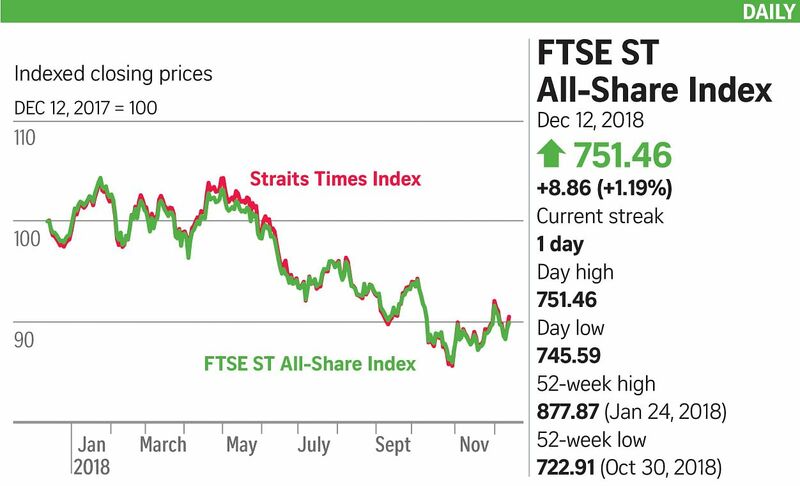 The Straits Times Index broke a six-day losing streak with gains of 40.71 points, or 1.33 per cent, to close at 3,099.99. Turnover was 1.1 billion shares worth $968.3 million with gainers outnumbering losers 239 to 143. Ezion Holdings was again the most active with 118.6 million shares changing hands. The offshore and oil-linked counter jumped 6 per cent to 5.3 cents, tracking a rise in oil prices on news of production cuts from the Opec+ coalition. A Monetary Authority of Singapore survey of economists estimated that Singapore's GDP growth would ease to 2.6 per cent next year, from 3.3 per cent this year. Previous projections put GDP growth at 3.2 per cent for this year and 2.7 per cent next year. All the survey's respondents cited trade protectionism as the top risk.